India is today recognized as a world centre for education. Indian entrepreneurs are making a through out the world. Their ideas, technical knowledge and entrepreneurship have yielded unprecedented growth in income, employment and wealth. The credit goes to the sound and practical educational foundation they have received in India. Wide Choice of Universities: India has the second largest education system in the world. With over 300 universities and 15000 colleges offering the widest spectrum of courses. International exposure (Recognition): For centuries, India has been the global centre for Education. Building global leaders: The professionals trained in Indian Institutions are recognized globally. Over 200 of the Fortune 500companies recruit from Indian campuses regularly. Affordable education: India offers Quality Education at a fraction of cost compared to other educational destinations. English Medium: India has the Third Largest English Speaking population in the world. Medium of instructions in higher education is primarily English. World-class institutions and faculty: It is mandatory for all the Indian Institutions to be recognized by the appropriate National Level statutory bodies established by the Government of India for compliance to quality & standards of education. Develops the creative side of the personality: Indian education is based on personalized approach to teaching, embodied in the Gurukul system where a teacher interacts on a one-to-one basis with students, helping them out in their difficulties. 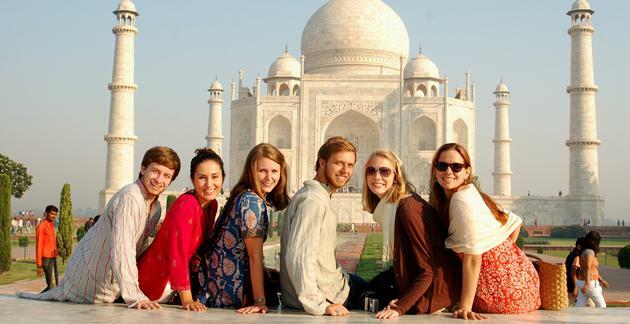 Friendly environment: India extends an unbiased welcome to students of all nationalities, cultures and religions. Holistic education: Cultural and religious diversity on Indian campuses contributes towards the all round development. Beautiful Country, Beautiful People: Known for its natural beauty and mystique appeal, the Indian experience is unique and enduring. Networking with world markets The educational philosophy that has come to prevail both in India and in the developed world is that the interaction of institute with industry at every level is very important. India has the second largest education system in the world. With over 310 universities and 15500 colleges offering the widest spectrum of courses. 36 Engineering and Technology Institutes such as Indian Institutes of Technology, Indian Institute of Science, etc. 15500 Colleges of Engineering, Medical, Arts, Humanities, Social Sciences, Commerce, Science and Management Education. The courses as well as professionals trained in Indian educational institutions are recognized the world over – 200 of the Fortune500 companies regularly participate in campus placements in Indian institutions. In traditional subjects like arts and humanities, pure sciences, applied physics, chemistry, and mathematics, Indian universities and institutes of higher studies have been playing a leading role. For the Humanities, Social sciences and Commerce courses, the medium of instruction is both English and regional languages but in case of professional courses, science and technical subjects, English is exclusively used for teaching. Postgraduate education is taught in English in most of the educational institutes. For international students weak in English, most colleges and universities conduct special English language and communication courses. India offers Quality Education at a fraction of cost compared to other educational destinations. The quality of Indian education is comparable to the best available anywhere in the world, while the costs are less and affordable. All these developments and initiatives have brought the country to the forefront as a technologically advanced nation. In fact, a large number of developing countries today look at India for training and guidance to further their development initiatives. Indian Council for Agricultural Research (ICAR) NAAC) for higher education. National Policy on Education – 1986 has stipulated the role of a teacher, which includes instruction, curriculum development, instructional material development, research and innovation and testing and consultancy services. A lot of measures have been taken up by the Indian Government to ensure that the teachers are trained aptly to perform their given role adequately. As an initiative to bridge the gap between curriculum and syllabus development and education delivery, the policy stipulates the involvement of teachers in developing courseware. Optimum infrastructure in terms of research labs, equipments and lecture theatres are very important for effective delivery. The universities and colleges are given adequate grants every year to ensure that they are able to maintain and upgrade their infrastructure. The policy advises on certain minimum standards which every Institute should maintain. To give a more practical perspective to the classroom training, Workshops and seminars have been integrated with the curriculumâ€™s of a number of professional courses. These workshops ensure that the students get an opportunity to demonstrate their skills practically, and get a hands-on experience. Indian education is based on personalized approach to teaching, embodied in the Gurukul system where a teacher interacts on a one-to-one basis with students, helping them out in their difficulties. College festivals, sports meets, student clubs, etc., form an important part of a student’s activities in Indian campuses and go a long way towards overall development. Students are also acquainted with some aspects of India’s economy and commerce through visits to public giants and private enterprises. Studying and living in India is a special experience. India is a country rich in cultural heritage, having multi religious society. A cosmopolitan environment and easy acceptance of all cultures and religions, makes India a friendly nation. Studying and living in India is a special experience. India is a country rich in cultural heritage, having multi religious society. A cosmopolitan environment and easy acceptance of all cultures and religions, makes India a friendly nation. Known for its natural beauty and mystique appeal, the Indian experience is unique and enduring. The educational philosophy that has come to prevail both in India and in the developed world is that the interaction of institute with industry at every level is very important. Keeping this in mind, the Indian Government has taken measurable steps to promote the association of industries with institutes. In line with this AICTE (All India Council for Technical Education) has been set up Board of Industry-Institute-Interaction (BOII) . Besides, India is also recognized the world over for its information technology talent.